Our senior services in Easton’s Fork Township. There are many lifestyle options and different levels of care to consider. We understand this can be overwhelming. That’s why we work with each family to find the right lifestyle choice and (if needed) the right care. Unlike a skilled nursing facility or assisted living home offering only one level of care, we have designed a full range of senior services. This way, we can support residents in their current stage of life and can continue to support them if and when their needs should change. 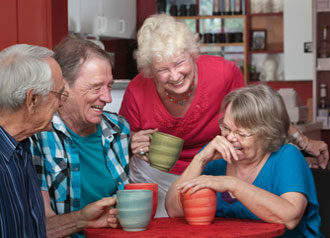 This lifestyle is ideal for active older adults to concentrate on enjoying life without the burdens of home ownership. With the ease of apartment living, a main meal served each day plus a continental breakfast, weekly housekeeping, transportation to appointments and shopping, and 24-hour access to staff, Independent Living is for seniors who want to make the most of retirement life on their own terms. This level of care provides individualized assistance to residents who need help with activities of daily living like dressing, bathing or medication reminders, so they can remain involved and active. It also provides minimal skilled care services (such as IV care under RN supervision) to supplement the non-medical services. Our Assisted Living senior services include three meals per day in our restaurant-style dining room, the privacy and amenities of apartment-style living, plus the personal assistance for a better quality of life. Through our innovative Connections Memory Support Services program, we offer personalized therapeutic care for individuals with memory loss caused by Alzheimer’s disease and other types of dementia. This unique comprehensive program is available in our secure neighborhood. If ultimately a rehab/skilled nursing facility is needed, our nearby Bethlehem community offers 24-hour Medicare-certified nursing care and extensive rehabilitation therapy for added peace of mind. We can help make a seamless transition to this campus and continue to provide the same high quality care and support. Then contact our team today to schedule a personalized visit any day of the week.